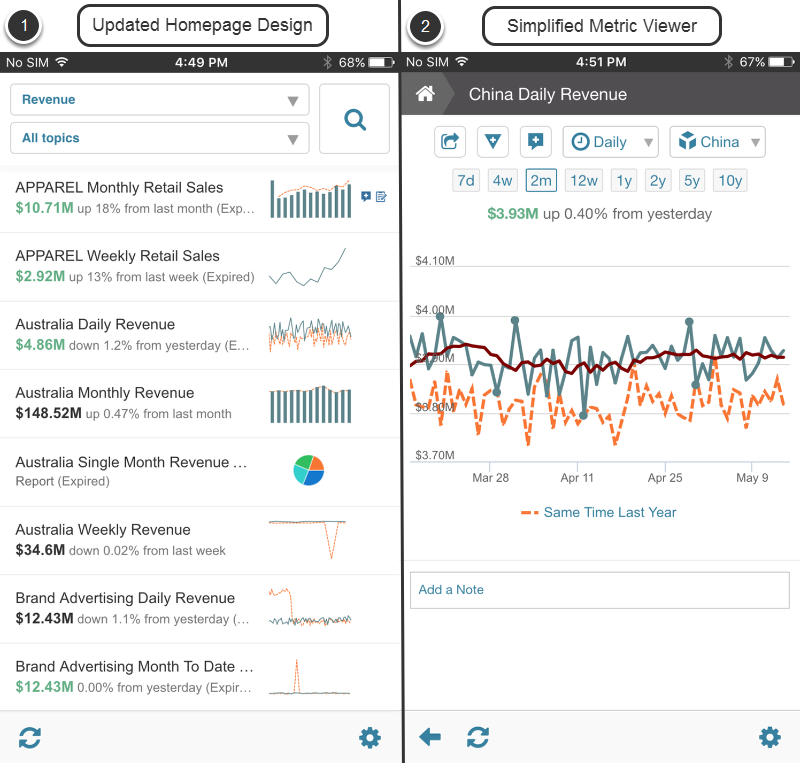 Metric Insight's latest release, 4.1 is now available for use by customers. The system navigation menu has been improved and re-organized to make it more intuitive and handy. 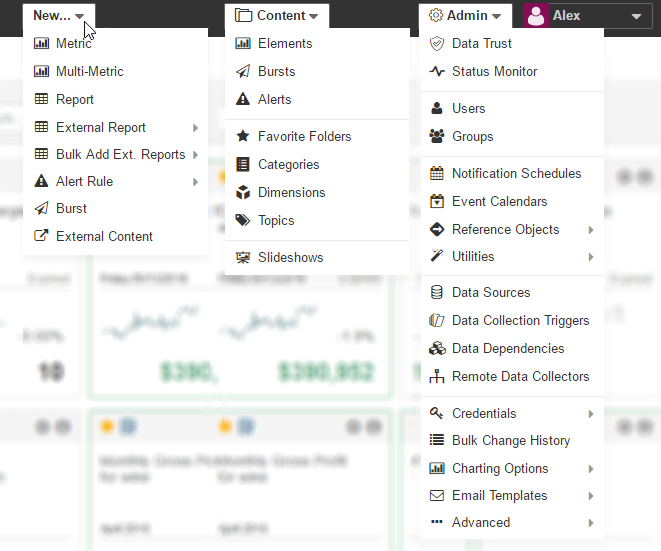 The updated Admin and a new Content menus allow you to access what you need right away. These drop-down menus replace the entire Admin page and the old Admin menu used in Version 4.0 and prior ones. For more details see Accessing Admin Editors and Functions (Version 4.1). To inform Metric Insights Users (everyone or specific User types; e.g., Regular Users or Admins) on any news, changes or instructions essential for the seamless company operation, the new Homepage message feature has been provided. When enabled, the message is displayed at the top of the Homepage below the page filters in Tile, List, Grid and News Views. For more details see Creating a Homepage Message (Version 4.1). Statistics summary information at a glance has been added next to the chart in the Preview and full Viewer. NOTE: The subcategory is shown at the Homepage once at least one element is added there. A new option has been added to the element Editor to show the relationship of a certain element to other related Reports, Metrics and Alerts. 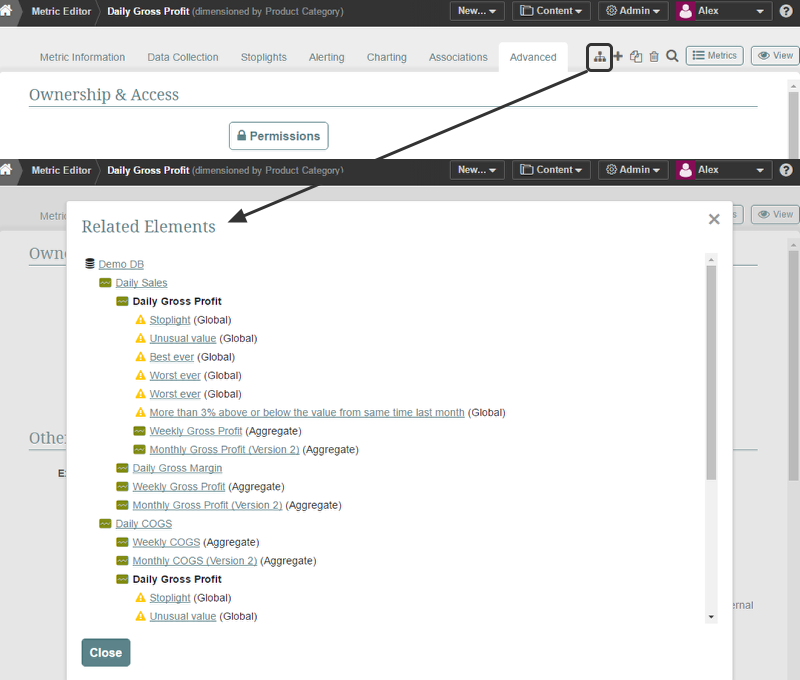 A new icon for this feature is located to the left of Add, Duplicate, Delete and Search icons at the Element Editors. This new feature allows you to track that status of your Data Collection Triggers and Notification Schedules. Create custom subtotals over selected Dimension Values and show appear in Metric Viewer; for example, 'Western Territory Subtotal' can contain an arbitrary selection of Dimension Values in that territory. 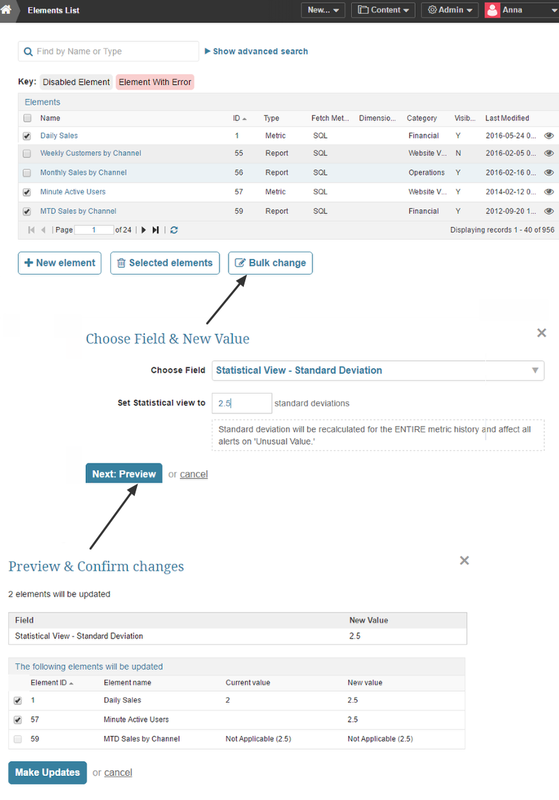 For details on setting up the subtotals, see Add a Total or Subtotal to a Simple Dimension. You can now attach files to Expert Analysis as well as to Annotations and Comments. Animated .GIFs are also now supported in Comments. For details on accessing this function, see What is Expert Analysis? 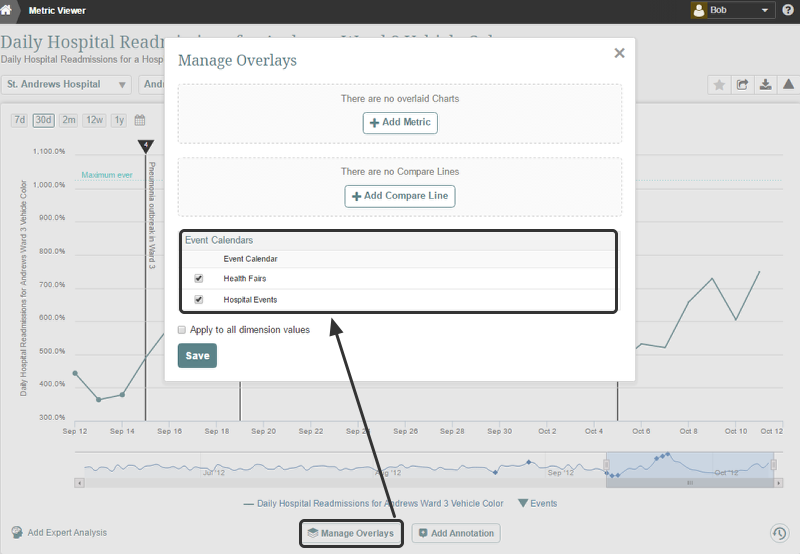 The list of Event Calendars applied to a Metric has been added to the Manage Overlays pop-up screen. This allows any user to choose which Events should be displayed at their customized Chart views by selecting Event Calendars from this list. Custom Scripts: Custom scripts can be written and run as part of Notification Schedules. This allows you to extend and automate almost any action in your data pipeline. 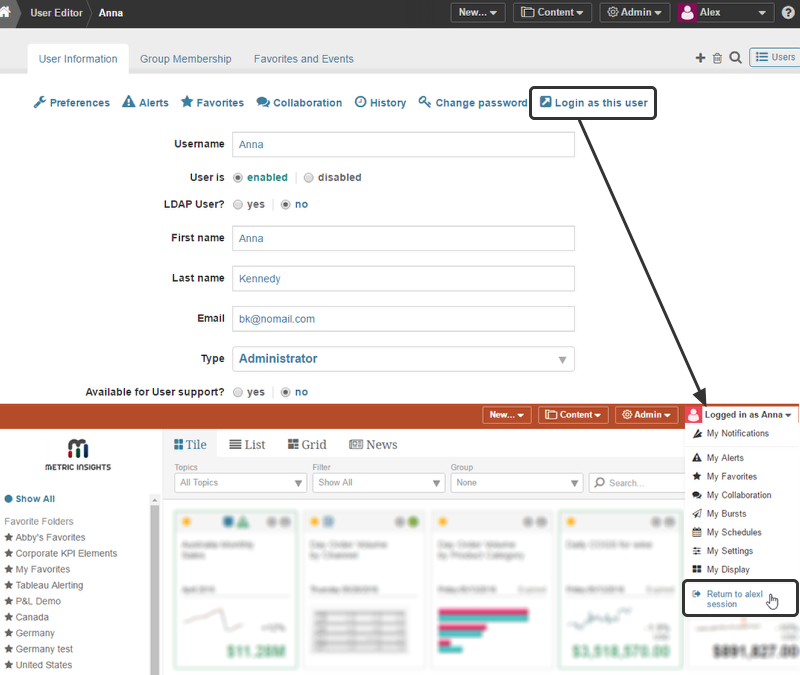 An issue with auto-subscription to Alert Rules when using Tableau Integration: When a new Alert was added to a Metric that was generated via Tableau Integration, the Alert and Metric creators were not subscribed to this Alert automatically, although the subscription was confirmed in Alert Creation Wizard during the Alert creation. The subscription now is created automatically. Unmasked password when creating a Splunk plugin: When a new Plugin connection is established, the credentials to the corresponding Data Source (username and password) is now provided along with other required information, and the password field was unmasked. These are not being passed properly. An error when gathering data for Dimensioned Exception Reports: When the Dimension of the dimensioned Exception Report was sourced from 'Metric and Report Data', no data was validated for this report. An Issue with Excel file download: In case of an attempt to download a Report as an Excel file, the file size was "0" bites. There have been no similar issue with CSV files. All file types are downloaded correctly now.